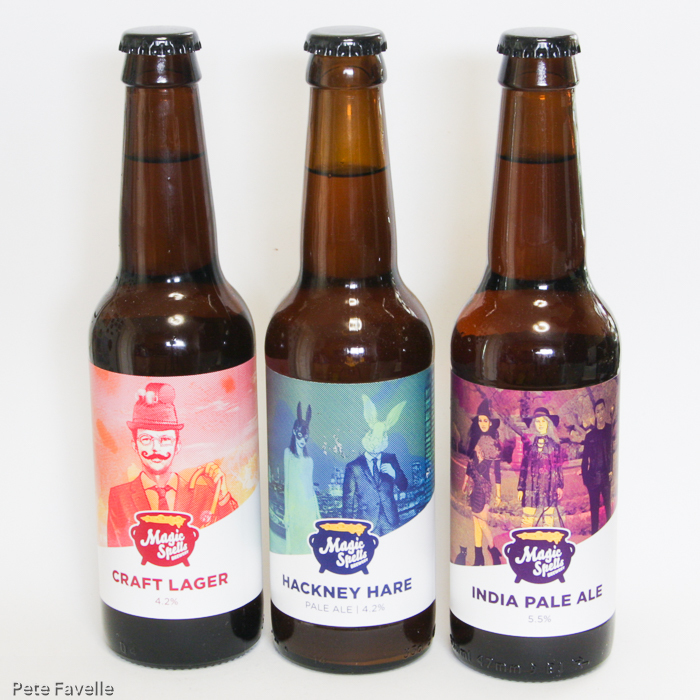 Magic Spells Brewery are a new East London brewery, very firmly at the ‘craft’ end of the beery spectrum. They have a familiar enough backstory, starting with (a rather substantial 1/2 barrel) homebrewing background 3 years ago and finally going commercial at the start of this year. At the moment they’re still ‘gypsy brewing’ in places as far afield as Essex and even Cornwall, while their own 10 (or possibly 15) BBL plant is installed. They’ve kindly sent over their three launch beers – a pair of pale ales and the inevitable lager – with special editions now starting to appear; another lager and a double IPA. 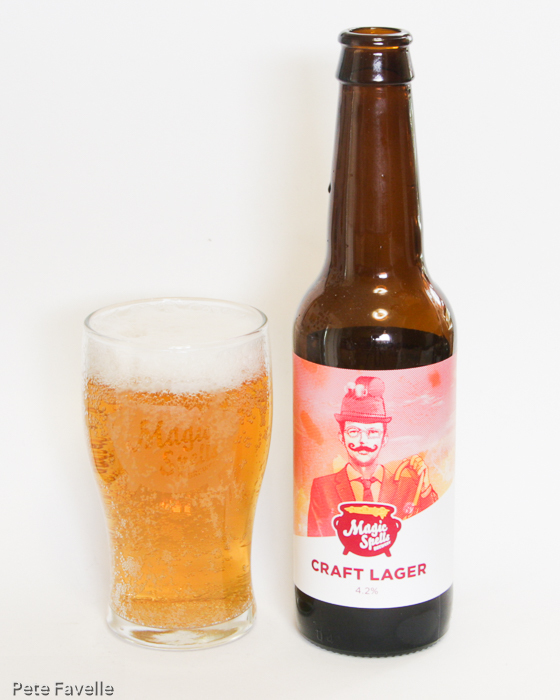 Craft Lager is a plainly-named 4.2% ABV lager made with Perle, Saaz and Tettnang hops. Visually, it’s a pale golden beer with a thin, fine foamed head. The aroma is quite floral for a lager with slightly green hops and dark honey. In the mouth, it’s light and gently sugar sweet to start, quickly yielding to quite a pronounced, drying hop bitterness. There’s a lemon fruitiness to it, and a finish that manages to be both slightly sticky sweet and refreshingly dry all at once. To be honest, I’m not usually a big lager fan – they all tend to blur into blandness – but this is a distinct and flavourful example. A solid start! 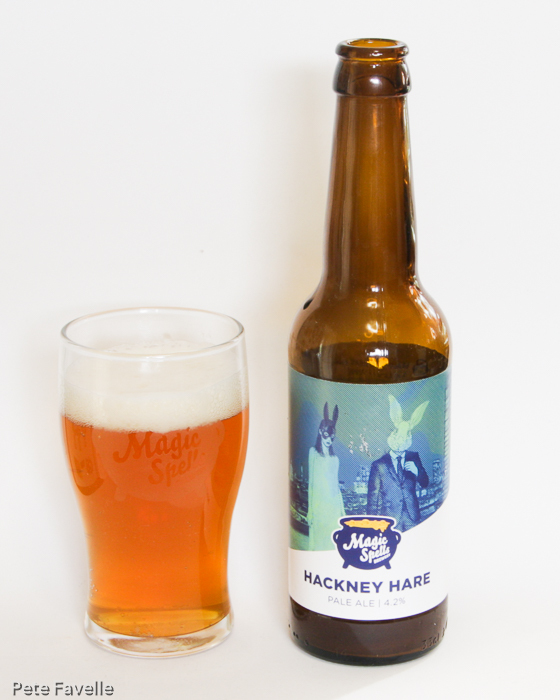 Hackney Hare is a pale ale, also bottled at 4.2% ABV, this time with Cascade, Columbus and Motueka hops. It’s another pale golden ale, with a slightly deeper but still finely textured head. The aroma is curious; cloves and over-ripe oranges, it’s almost reminiscent of Belgian yeast. Beneath that there’s also some grapefruit and a little biscuity malt. On the tongue there’s a lot going on; lots of fresh, citrussy hops bringing a light fruitiness and lots of drying, slightly resinous bitterness. And then the Belgian character again, with woody spices and even those banana-y hints. 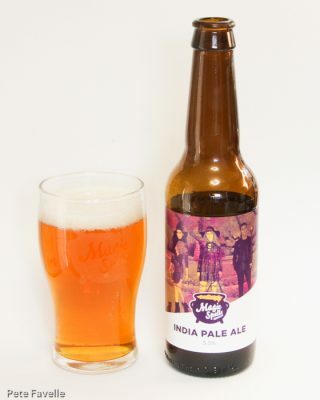 The finish is dry and lingering, and overall it’s an intriguing and unusual pale ale. Lastly India Pale Ale is a more substantial 5.5% ABV with Chinook, Columbus and Mosaic hops. Visually, it’s much the same. The aroma is full of tropical fruit; it’s more like 5-Alive than beer! Beneath all that fruit lurks a little floral hops and perhaps a touch of malt but this really is all about the fruit. In the mouth, after an initial burst of fruity sweetness, a nice resinous hop bitterness kicks in; deep and powerful but deliciously balanced by all that tropical fruit. The finish is long, piney and bitter and leaves you wanting more. This is a properly decent IPA, and at only 5.5%, it’s dangerously sessionable. Overall, I’m impressed by Magic Spells. I confess that I was expecting to be dismissive, with their self-consciously ‘crafty’ branding but they’re making some tasty and different beers; what more can you ask of a brewery? Many thanks to Magic Spells Brewery for sending these beers over to try.